I know your feelings about that but it's better for the game because when you are a new in PZ using Triangle button is more confusing. Most of games and PZ use Circle for exit from current window/menu or for cancel current action. PZ already use Circle for exit from most windows so I added inventory to that number. You just need to get used to. Also this change gave you the opportunity to quickly loot a container by double pressing Triangle. I see the logic behind this post, but as I've posted along with some others, it is still confusing. Not to mention the fact that you HAVE to have the inventory open at all times while doing certain actions like reading and eating. It makes sense to have it as B, because that's how you back out of menus, but we people are very accustomed to having a dedicated inventory button. I know that you posted in the topic on the last page about fixing the controller not being able to reconnect once it was disconnected, but on the topic of inventory management, the controls have gotten worse, I feel. You can read my posts, but very rarely do I go "OOO look, a container" and immediately want to loot all of it. I know what I need, and I sometimes don't have the time to press A three times for each item. You've added a button to transfer all, but that action was available to us via the context menu already. I implore you to consider changing Y to a quick move button like X was before. Also, I switch between versions to play with my girlfriend, and it is really hard sometimes because all the buttons do different things for the different versions. The best possible solution is to make the controls more customizable. I understand you're trying to iron out bugs, and in the long run, make a controller scheme that is appropriate for everyone, but not everyone will like the default controls, and I'm sure that I speak for many people when I say that for the people that played with a controller before they saw this "FREE CODES FOR PARTICIPANTS" thread, they were used to the controls. The buttons for backing out of the inventory didn't need to be changed because it made sense. However, what does need to be improved upon, and what I know is very difficult in determining, is "how many actions can we choose to map, and how many buttons can we map them to?". If you address this issue and continue working out the bugs, then the whole controller test beta will go very smoothly. Again, thank you very much for all the work you've done in helping us. We all appreciate it. We know you're busy and can't monitor these threads as much, for instance, like I do, but what you've done so far is very good. We know you're human and that it can be hard to know what other people want, but trust me. A more customizable controller scheme is the way to go. Constraint on us will inevitably put a constraint on you in terms of solutions to our problems. Thank you and have a good day. So I didn't play since the update 6, and played update 13. And man what a progress ^^ ! Please check out the new gamepad customization menu in the Options. Does it work, and does it make sense? Is it relevant to the pad you’re using? How could it be improved? How does your gamepad feel in-game? Is there anything missing, and has anything changed that you’re used to playing with? Wel i played for about 2 hours, starting a new character twice. Everything was smooth. The only things I would change is, accordingly to a post of Kaleidozombie, assign a simple button (say B) to open/close the inventory, cause it's unintuitive to open with Y and close with B. Also, in inventory : Assign X to take something, it's boring to double tap A to take an object. 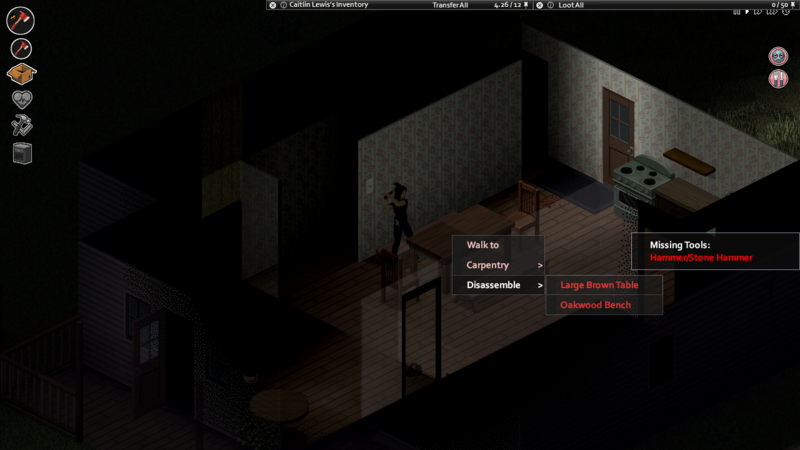 And use A button to see the condition of an object. What other gamepad bugs or weirdness have you noticed in this build? Well maybe i had luck but nothing particular. This build also contains a java lwjgl upgrade. Have you noticed any changes in game performance and stability, especially at higher resolutions? What's the Number 1 most important issue that you'd like to see resolved in the next update to this beta? I'll try to craft more objects and do more things in my future runs. X used to the button to quick move items from a container to your inventory, but unintuitively would be the button to move things to the floor. B used to be the button to show an item's info, but that is now X, removing the function of a button. I agree with you that there needs to be a dedicated quick-move button. Merged with latest Build 40 and subsequent issues resolved. Really liking the new device options menu, thank you. When you go to select an item to build or disassemble in the context menu, the window with the requirements is missing. Nothing changed in this way. Yes, we have plans about it but I can't promise anything about it. Alright, will the build 41 that adds controller support be just Windows then? I'm excited to use a controller with PZ soon! Please check out the new gamepad customization menu in the Options. Does it work, and does it make sense? Is it relevant to the pad you’re using? How could it be improved? - Yes, as a big fan of steam controller (sadly not in my possession at the moment) I think visual implementation is intuitive. I think being able to reconfigure the radial menus accessed by the D-PAD can be useful; I'm of the philosophy that the more customization the better. How does your gamepad feel in-game? Is there anything missing, and has anything changed that you’re used to playing with? The gamepad feels great, the only thing that was didn't feel as intuitive was the toggling of the running in conjunction with using an analog stick to control walking speed. Right now the "run" button is set as a toggle, and merely permits running when the analog stick is held all the way to the side. I think having the ability to set it to have a "hold" function would be more intuitive, because sometimes I may forget that I left it on or off. I would personally bind it to the L bumper since I use it more than I use guns in the game. How would you like your gamepad play further improved? I think having access to more customization options (such as being able to rebind the face buttons) is the biggest improvement to be made at this stage. As someone else stated the steam controller would be a PERFECT fit for this game. I think Valve's implementation of modifier/shift keys for the controller is pretty brilliant, and since this game is on Steam, you could probably actually just let the steam controller's remap function take over. As for improved native implementation of controller functions, I think to emulate what valve has achieved with its steam controller customization would be what I would aim for. And I just remembered that you can now customize any USB controller with the Steam controller interface, so I'm actually about to try that right now! Do you play in split-screen? If so, how is this beta playing? No, I don't, but I've tried it with myself and could not get player 2 (controlled by my controller) to perform any actions with the face buttons (such as loot, etc). If this is a bug, then it's an obvious one. 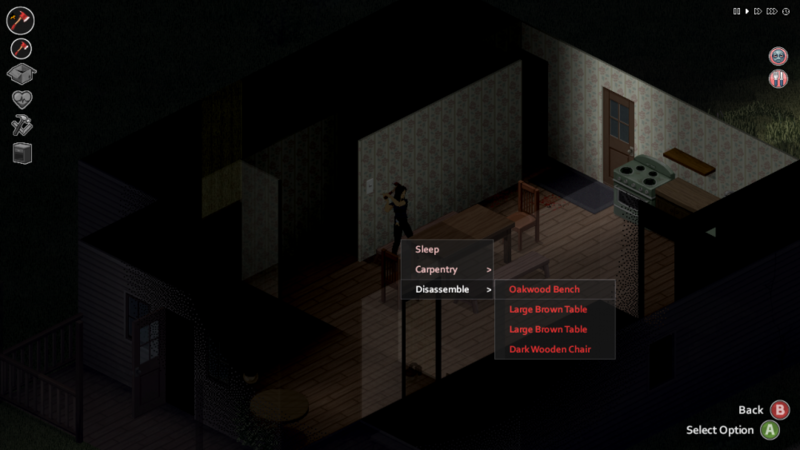 In the current game when you use inventory and character windows, your survivor on-screen can still move and perform some actions. If we were to forbid this, and have you either controller as your survivor OR having you navigate the UI, how would you feel? How would this change your playing style? I would like to retain FULL control of my survivor when character windows are up. Right now, while looting things or managing inventory, the right analog stick is not functional, and I can't figure out why this is since it does not really control any of the windows. Movement is essential, especially since managing windows does not pause the game. Either give full control to the character (at least being able to look around, etc) or auto-pause when accessing the inventory (less ideal since shuffling items around is real-time in this game). Overall I think PZ is a perfect fit for controllers given the actual control of the character itself is more vector based and interaction with the environment is proximity based. When I play with M/KB, I like to leave some windows up so I can keep an eye on my health status/what's in my backpack, etc. Being able to pin some of these windows, if only to view them, would be a good step forward. Maybe just highlight them a different color to notify the player that you can't actually interact with it. What other gamepad bugs or weirdness have you noticed in this build? As stated above, split screen player 2 with controller = face buttons don't work (can't loot, etc). This build also contains a java lwjgl upgrade. Have you noticed any changes in game performance and stability, especially at higher resolutions? Not that I've noticed. What's the Number 1 most important issue that you'd like to see resolved in the next update to this beta?﻿ 1. Pinning windows while maintaining full (or at least better) control of the character 2. More customization of face buttons, etc. If you have Windows, you can already use one! How cool is that! True. However, I do not have a copy of Windows. Was wondering if anyone else was having the same issue as I am above. My gameplay is kind of halted at the moment because It's way too annoying to switch between KB/M and gamepad just to see the requirements of a building piece or item of furniture. I can confirm this is not showing.